Wash hands. Preheat oven to 425°F. Pierce bratwursts with a fork. Then place in a large pot. Pour the beer over the brats and bring to a simmer Cook until the bratwursts are no longer pink inside. Remove the bratwursts from the pot, let cool, and then cut into 4 equal-sized pieces. 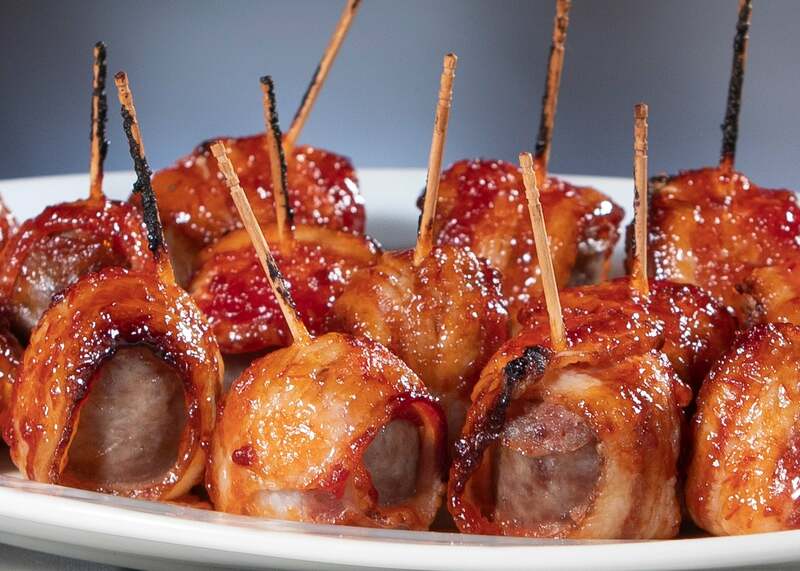 Wrap each brat piece in a half slice of bacon and secure it in place with a toothpick. Place the wrapped bratwurst on a baking sheet and repeat for the remaining bratwurst pieces. Set aside. In a small bowl, mix the chili sauce and brown sugar together. Generously brush the bratwursts with the mixture. Bake until the bacon is cooked and the glaze caramelizes, about 20 minutes. Serve with chives and mustard, if desired.